One purchaser said that this product did not agree with this stomach and had to stop taking it. The general response for Solaray Ashwagandha was overall positive. People liked the overall effectiveness that this ashwagandha extract provided and appreciated the plant based capsules. On the other hand, the plastic container and extra filler ingredients were deal breakers for some consumers. One serving of Solaray Ashwagandha recorded 470 mg of ashwagandha root extract containing 7 mg of withanolides (1.5%). 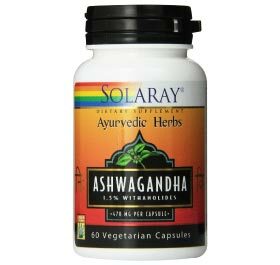 Overall, Solaray Ashwagandha is an inexpensive ashwagandha product. It does come with some shortfalls like containing Maltodextrin (as Carrier), Magnesium Stearate and Silica. If you’re looking for a good brand that doesn’t use gelatin based capsules but don’t want to pay a high price tag for plant based capsules, Solaray can do the job. Contains Maltodextrin (as Carrier), Magnesium Stearate and Silica. One serving of this product recorded 470 mg of ashwagandha root extract containing 7 mg of withanolides. Studies show that the benefits of ashwagandha tend to appear around this dosage. However, we do prefer at least 10 mg of withanolides per serving for maximum potential benefits. Brand is well known. Products can be found in many retail stores. Vegetable cellulose capsules, no gelatin. Contains Maltodextrin, Magnesium Stearate and Silica which can cause some issues in a few individuals. Product receives a penalty for having these ingredients in its formula.